Do you need to verify IACP certification status on an individual before entrusting them with a certified auto appraisal? 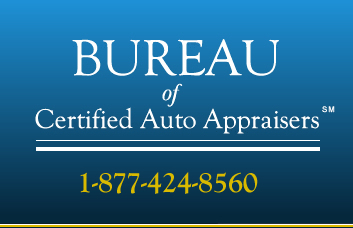 This feature allows you to verify current status of certification for an individual certified by the Bureau of Certified Auto Appraisers - IACP. You need to know their full name in order to perform the search. Alternatively, you may enter the certification number below. This number can be found on the wall certificate produced by the appraiser. The search will return the certification number, a name, current status and an expiration date for that individual. BOCAA strives to maintain accurate, reliable, and current information on certification. However, inadvertent mistakes may exist in our database. If you discover an apparent mistake or discrepancy, please contact the Independent Appraisers Certification Program department immediately at 1-877-845-2368. Search by first name, last name or IACP certification number. BOCAA strongly suggests that the certification identity be verified with a government issued photo identification card, such as a driver's license. Become an IACP Certified Auto Appraiser in 40 Hours. Start your own Independent Auto Appraisal Business and start making money. Minimum startup costs – Cell Phone, Laptop Computer, Printer, and Website. Potentially earn $150K+ income working part-time – set your own hours. Retained by Attorneys, Insurance Companies, Corporations and Private Individuals. Provide your clients with the most accepted auto appraisal reports in the industry. Testify confidently at Depositions, Mediations, Bench and Jury Trials. Learn Law for Appraisers, Insurance Adjusters, and Expert Witnesses. Diminished Value, Total Loss, Classic Car Appraisals and more. Banks & Credit Unions are now requiring IACP Certified Auto Appraisals. Declare Damaged Vehicles to be Repairable or Total Loss. Comply with BOCAA & USPAP Standards when appraising for profit. Secure login access to NADA, AuctionNet, Manufactured Homes, and other valuation guides. The Bureau of Certified Auto Appraisers administers the IACP Certified Auto Appraiser Certification Course and Final Exam. Start your own independent auto appraisal business today. IACP Certified Auto Appraisers are in demand. The Bureau of Certified Auto Appraisers holds the key to opening the door to this demand. BOCAA.org is the leading online auto appraisal course producer of men and women who have successfully started their own third-party appraisal company after obtaining IACP certification. Credit Unions, Banks, Courts, Insurance Companies, Attorneys, Corporations, CPA’s, Government Agencies, and vehicle owners are now requiring IACP Certification. IACP Certification is preferred for Legal and Certified appraisals such as: Personal Property Valuation, Insurance Claims, Total Loss, Damage Estimates, Stolen Vehicles, Bank Loans, Pre-Purchase Inspections, Court Ordered Appraisals, Actual Cash Value, GAP Total Loss, Divorce Appraisals, Estate Appraisals, Probate Appraisals, Investment Appraisals, Manufactures Defects, Consumer Protection Lawsuits, Class Action Lawsuits, Criminal and Civil Lawsuits. Looking for your next appraisal assignment? Members can access employment opportunities throughout the United States, Hawaii, Puerto Rico, USVI and the Cayman Islands. 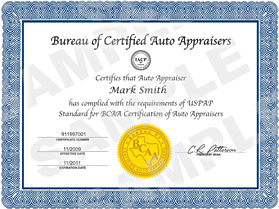 Are you an employer requiring an IACP Certified Auto Appraiser on an appraisal? Contact us for more details today! IACP Certified Auto Appraiser Course and Texas Insurance Adjuster Pre-Licensing Course. Each Online 40-hour Certification course can be completed from the comfort of your own home.